ViaBlue™ TVR rca connectors are 24 karat gold-plated high-end connectors that have a metal casing that builds a complete shielding for coaxial cables. Unplugging conventional antenna cables from antenna jacks often results in breakages in the cable, which causes loose contacts and image interference. The goal of the ViaBlue™ TVR concept was to produce a plug that allows no breakages in the cable, gives the cable in the plug 100% strain relief, has 100% shielding inside the plug, is easy and convenient to install, has a genuine 24K gold-plated composition. 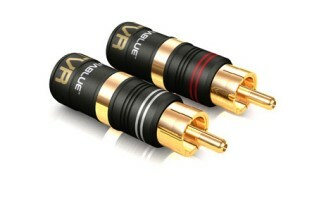 The result is the ViaBlue™ TVR Series: real 24K gold-plated high-end plug-in connections for all TV and radio connections, available in both straight and curved versions and easy and convenient to install. Simple assembly with or without soldering. Each TVR plug has a screw for making contact with the conductor. However, cables can also be soldered. The cables inserted are anchored extremely tightly in the plugs by a robust and large fixing screw that prevents their unplugging or loss of contact. ViaBlue™ TVR F connectors are 24 karat gold-plated high-end connectors that have a metal casing that builds a complete shielding for coaxial cables. The assembly can be made with screwing or soldering.